ESD Wrist and Heel Strap Tester LOGS Results! The CT-8900 Advanced: $1,599 and In Stock! Flawless PAPERLESS Compliance Tracking for Your ESD Program! Eliminates log books and Cheating! Documents and Insures Compliance to ANSI/ESD S20.20-2014! Provides complete easy to comprehend reports for supervisors and ISO Audits. Input the employee name manually or with ANY type of employee ID card. Track from 1 to 30,000 technicians with EASE! LOWEST PRICE / BEST SERVICE GUARANTEE: If you find the following items at a lower published price let us know - we'll beat it by 3% and send you a free static control gift for your time! It's a Problem and it Happens Every Day! A technician stands in line waiting to test their heel straps and wrist straps. They're late, under the gun and already stressed "Just great! Now my heel straps failed." They think to themselves "I'll change them out when I have more time" - they sign the log and are off to building potentially compromised product. The Solution: The Ohm-Stat CT-8900! Today over 100,000 technicians located in the U.S.A. and Worldwide will test using the CT-8900! It's refined time tested technology guarantees accurate compliance tracking with No Cheating Allowed. Whether your needs are for a single test station or multiple networked stations Static Solution's got you covered! SO Easy to use and equally easy to comprehend the results! A Technician simply swipes their employee ID Badge (or enters their name on an attached PC), stands on the foot plate (and/or) plugs into the wrist strap input. They hit the test button and within 3 seconds the test is complete! Testing Completed in under 3 seconds! Testing time, Employee information and Pass / Fail Results (with actual readings in ohms) are logged and stored in the devices memory. Out of compliance technicians are alerted immediately (supervisors can be automatically emailed) and with an option the device may be setup to even allow security doors to open (ONLY for passing technicians). This easy to comprehend tool is invaluable for any esd program. The tool is NIST Traceable, CE, RoHS and S20.20 Compliant. 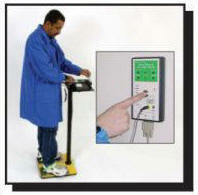 A Calibration certificate is included with each unit. 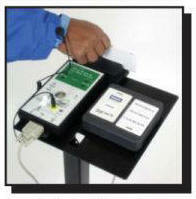 The CT-8900 may be calibrated internally OR sent back to us on a yearly basis if easier. A Proven Performer at a Realistic Price. Scan using a keyboard or an Employee ID card. Optional readers accept all types of electronic employee ID cards. 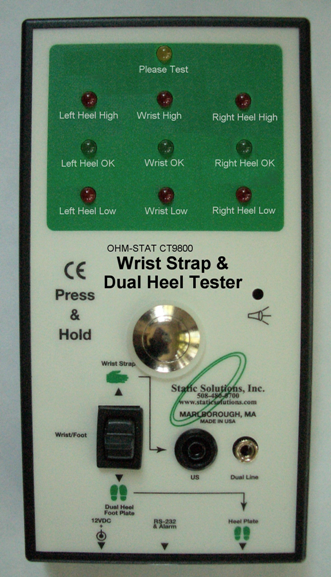 Attach Wrist Strap, step on dual plates and press the test button. Easy to comprehend results in THREE seconds. Employee reads results, supervisor analyzes data and can generate exception reports or have failing results sent via email. Device and readers preprogrammed for your Company ID card at No Charge. Free software and upgrades for Life. RoHS compliant and free of conflict materials. Software compatible with ALL versions of Microsoft, from Windows 95 to Windows 10! Can monitor up to 30,000 people a day! Provides a pass/fail and a readout in Ohms - lets you know if your straps are wearing out. Eliminates cheating and filling out a handwritten log! Tracks employee attendance and vacation time and can even notify an employee when it 's time to get recertified! Download Trial Software from our manufacturer (scroll down their page to the CT-8900 Data Logging Software links). 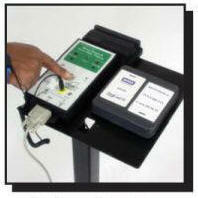 HR-8000 - HID / Casi-Rusco Reader and power supply $795. BC-8950 - Bar Code or Mag Stripe Reader: $435. CDR-9800 - Door Opening Relay (internal upgrade) for CT-8900 and CT8700 Tester: $270.00. CT-1000 - 1000 Meg Upgrade for CT-8900 Tester (for testing in the SD range): $280.